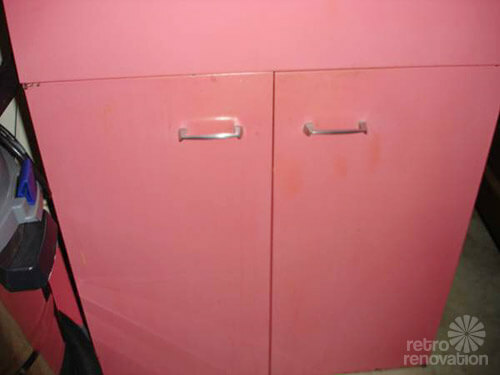 It isn’t every day that you find a set of raspberry pink St. Charles steel kitchen cabinets like this set for sale in Washington, D.C.. 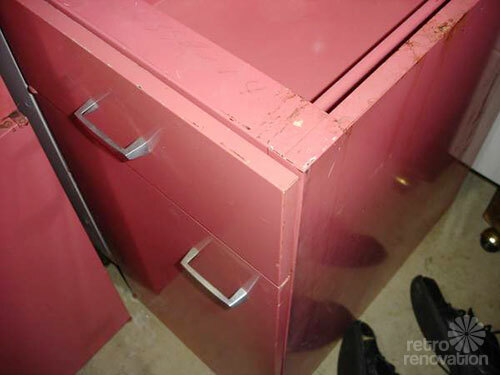 The color of this cabinetry — found printed right on the back of one of the cabinets: Raspberry. We love it — AND, we have an historical reference to demonstrate this is likely from around 1956 — not the flower power 1960s. Thanks to reader Debbie, who alerted us to this fantastic find, and to craigslist seller Kathe for allowing us to feature her photos. Early in the blog’s life, Pam wrote about this color, which she identified as “rose red”. 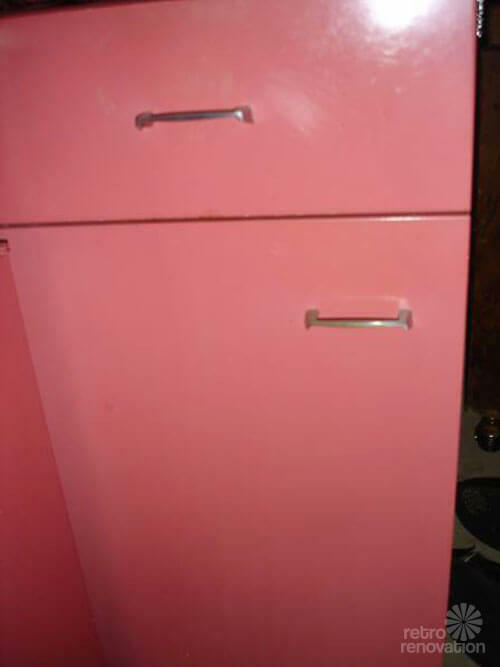 The color also seems to be a ringer for Sherwin-Williams’ Flamingo Pink, part of their Suburban Modern collection. See this story about what looks to be this very St. Charles kitchen color on an actual — in 1956. Yes, a raspberry kitchen, all decorated out. And… here’s a sofa and wallpaper showing this color — just to illustrate that the color was promoted for use in other spaces as well. $100 per cabinet EACH (CL doesn’t let me post EACH in price field). Both upper and lower metal St. Charles cabinets with stainless steel handles from an upper crust DC home in the 60s. Very mid century modern. In good condition, just need cleaning and installing in your place. 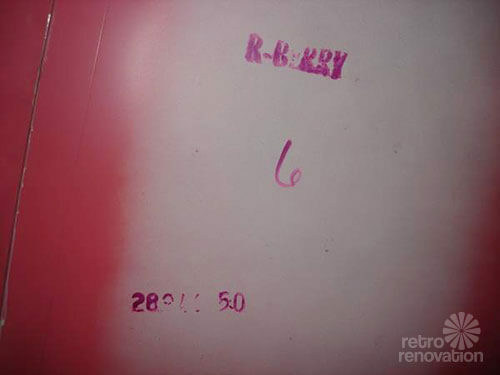 Original Raspberry Pink paint has some slight nicks and scratches consistent with 50+ years of use, but still quite a lot of character and usuable as is for an authentic look, or you could paint. You move from my split level basement, half flight of stairs. I was going to use them in a kitchen remodel but ended up using something else and need to find these a new home because we are moving. Email for pics and measurements. Also have some white metal cabinets, Geneva brand. $50 EACH, chrome handles. These have been painted once. These are great for retro, vintage kitchen remodel or even a dry garage. 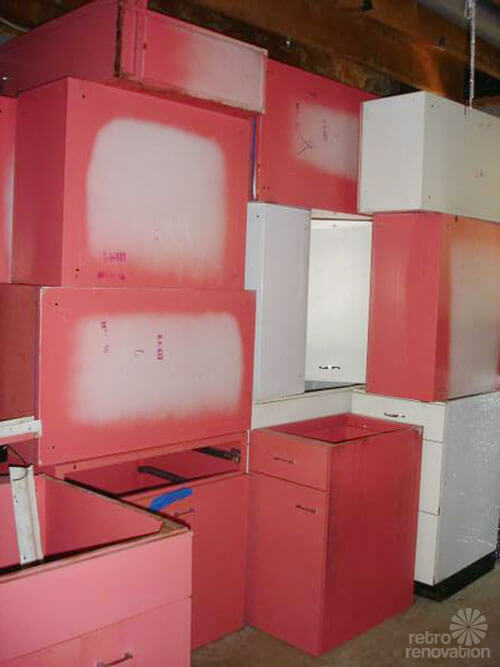 Mega thanks to Craigslist seller Kathe for allowing us to feature her photos of these fabulous vintage steel cabinets. See all our stories about steel kitchen cabinets here. We are the industry leaders on this subject, far as we know! 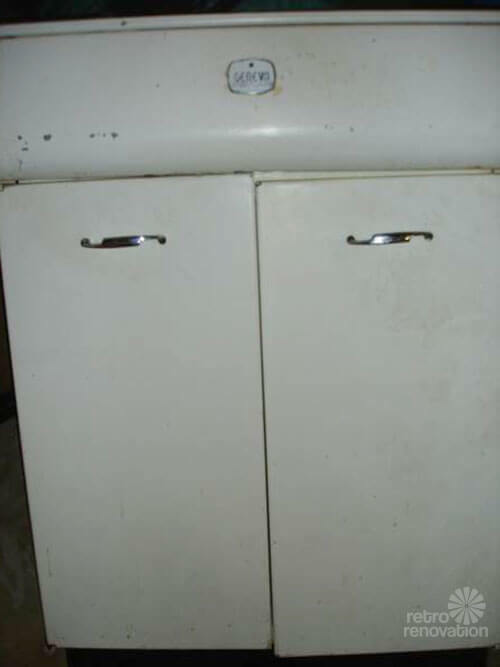 These have the same handles as my 1965 cabinets. Love the color! I am looking for a 20 inch base cabinet with drawers? We have a full kitchen of circa 1953 St. Charles metal cabinets. I am looking for parts (door fasteners, etc) but am willing to purchase a complete cabinet or two to get the parts. Availability & price would be appreciated. We need a metal/steel kitchen sink base cabinet or a Youngstown full sink and drainboard unit. Can you help?